"I KNEW I'd get into s---." Those words perfectly described what happened when Leeanne Maree Walters fell for a mysterious online lothario. The former Lismore woman was using dating site Plenty of Fish when asked to do a favour. Despite her intuition, Walters agreed to use her bank account to forward money in exchange for a small share of the total. 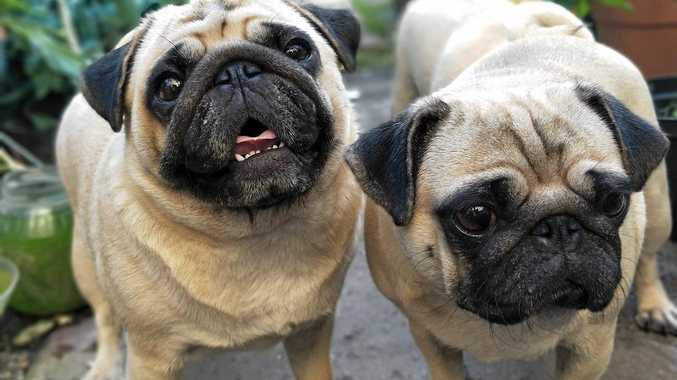 A court on Wednesday heard Walters used her share to buy two pugs, among other things. The unknown scammers tried laundering about $558,000. Banks blocked three out of four transactions but roughly $185,000 was never recovered. Walters, 46, pleaded guilty to recklessly laundering money, and possessing tainted property in Caboolture - including the dogs. Crown prosecutor Chris Cook told Brisbane District Court that Walters was "tricked". But without her assistance, "organised criminals" using her would not have succeeded, Mr Cook said. Defence counsel Kim Bryson said Walters moved to Queensland in 2016 after serious personal setbacks. Then she met a man on POF known as "James Lomeli". So-called Mr Lomeli seemed to promise Walters "not only love but support", Ms Bryson said. The scammer then asked for the favour. "I'm very remorseful," Walters told Judge Ian Dearden on Wednesday. Judge Dearden said Walters engaged in "reckless rather than knowing involvement in money laundering". The scammer used Walters' bank account to "flush" money, Judge Dearden said. The judge said he was saddened to see a woman like Walters with no criminal history finding herself in trouble. He told Walters if she was ever asked again to participate in a crime, she should "run a million miles". Walters was sentenced to two years six months jail but the sentence was wholly suspended. Outside court, Ms Bryson said her client did not want to comment. It's understood Walters still has the dogs.